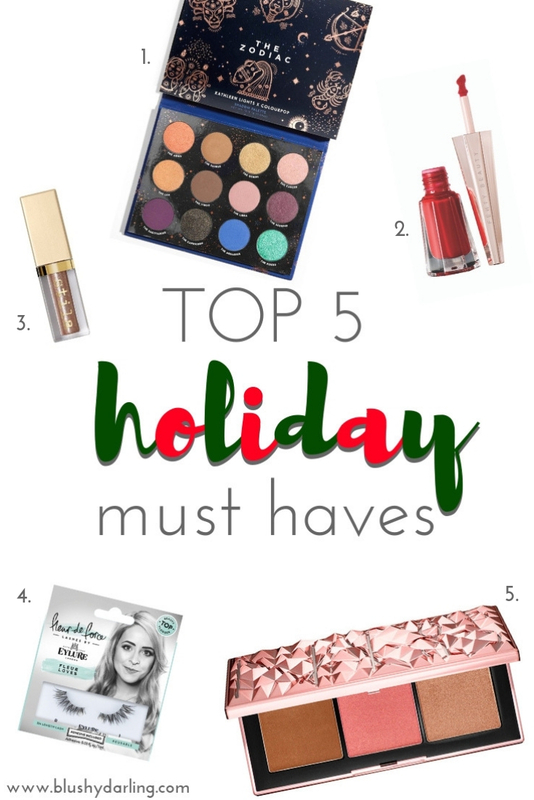 In today’s post I’m going to share my My Top 5 Holiday Must Haves. I picked up some of the products that I feel like for one reason or another would be staples during these next few weeks and I know I’d wear them a lot. All of these I’ve been using for awhile so I know how they work and I definitely know I’d personally use them a lot, I’ve done in depth reviews of most of these products which I’ll make sure to link if you want to learn more. I’ve got this palette over the Summer but for some reasons I’ve been gravitating towards it a lot lately. I has the perfect tones for any kind of Holiday look and it’s less than 20$, a total steal in my book since the quality is also great. What would Christmas be without a red lipstick? I usually go for MAC Ruby Woo but this year I was in a mood for a change, so Fenty was. I love the formula of the Stunna Lip Paint. Totally a must. I’ve used these glitter a lot and these from Stila are a cult favourite so they shouldn’t come as a surprise. They are blinding, easy to use and last a really long time, they come in a lot of shades so you could definitely find one for you, I have Kitten Karma and Diamond Dust with this one being my most used. I love these lashes because they are super easy to use and they look beautiful on. I’m not good when it comes to falsies but these are awesome for beginners. This palette comes with all you need for a perfect complexion, the packaging is stunning and these shades will suit a lot of skintones. The quality is great and since it’s limited edition I would grab it before it’s gone. WHICH ARE YOUR HOLIDAY FAVORITES? LET ME KNOW IN THE COMMENTS! Omg you are going to love them and right now they have so many sets where you can get more shades for the price of one! oooo so many good picks. I need 5 in my life! I am some need of new makeup. The Stila Glitter & Glows are the best cosmetic glitter, hands-down in my opinion! The stila liquid shadows immediately grabbed my attention! They look beautiful! I saw someone with the glitter and glow eye shadow on this summer and have been wanting it ever since. I am totally loving your holiday must have list. I certainly love the products that you have shared! I’m glad you love them! These are just perfect for the holidays, or really any special occasion! Thank you!